If you saw "22 Jump Street," you're already clued in. For the rest of you, get ready to be enlightened: actress Jillian Bell is your new deity. Bow down. That's just what we do now. Though Channing Tatum and Jonah Hill are the top-billed stars of the sequel, Bell steals the show as Mercedes, Hill's love interest's creepo roommate. Her character is like if Ann Veal, of "Arrested Development" fame, lost the Christian family and got a sense of humor. Bell has co-starred on TV's "Workaholics" for several seasons, and a webseries she co-created, "Idiotsitter," has been picked up as a series by Comedy Central. And even if you haven't seen one of her big lead parts yet, you've almost definitely seen her before, in the company of other hilarious women: She was an attendee at the disastrous, Paris-themed bridal shower in "Bridesmaids." Yeah, you've laughed at her before, and you'll laugh at her again. Go see "22 Jump Street" if you haven't experienced her wonder yet. If you have, well, go see it again. Laughter is cardio. 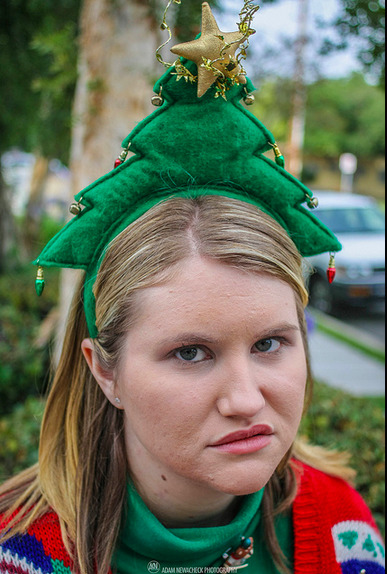 Ahead, 11 reasons why we worship Jillian Bell.